2. Open up the windows console by going to Start -> Run (or Windows + R shortcut) and type in “cmd” and press enter. 3. Type in “telnet” and press enter. This should open the Telnet Console. 4. Telnet Console being displayed, type in “o localhost 5554″. This will establish a connection with the emulator on port 5554 and open the Android Console. 5554 is the port number and you can see it on the title bar of the emulator window. 5. To send the sms, type in: “sms send 0789456 Hello World″. As a result, a notification will notify you that a new sms has arrived. 6. 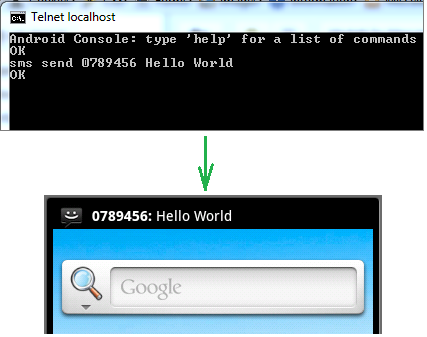 Use “exit” to exit the Android Console, and “quit” to quit the Telnet client. would be interesting to use wireshark at the same time and see the complete flow? Wow..!! That was a good thing . At least now i know that my SMS receiver is not working . It was the same way with DDMs , but this is better . Actually when i send sms from telnet client in android emulator it is receive in chineese chracters.only sometimes othertime it’s received in english….I hope u have solution…. I am using windows 7.Android emulator target version android 4.1 jelly bean..
Is it possible to send a SMS from the Emulator to someone’s or my android? I don’t think so, you need a SIM card for this.